DALLAS - Military service changed the gunman in a deadly attack on Dallas police from an extrovert into a bit of a recluse, his parents said in an interview excerpt published Monday. 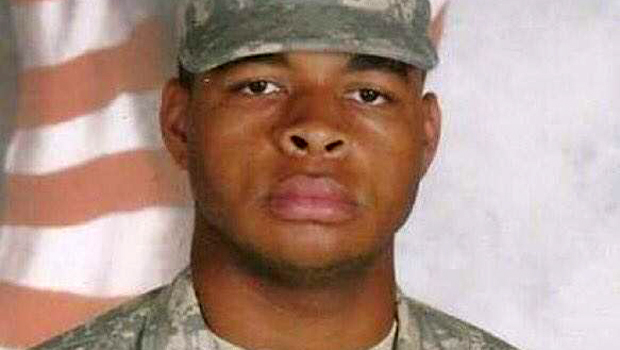 Micah Johnson's mother, Delphine Johnson, told TheBlaze website in an interview published Monday that her son wanted to be a police officer as a child and that his six years in the Army Reserve, including a tour in Afghanistan, turned Micah Johnson into a "hermit." "The military was not what Micah thought it would be," Delphine Johnson said. "He was very disappointed, very disappointed. But it may be that the ideal that he thought of our government, what he thought the military represented, it just didn't live up to his expectations." His father, James Johnson said haltingly and through tears: "I don't know what to say to anybody to make anything better. I didn't see it coming." Johnson, a black 25-year-old who was accused of sexually harassing a female soldier while deployed in Afghanistan, fatally shot five officers in Thursday's attack, which happened while hundreds of people were gathered in downtown Dallas to protest recent fatal police shootings, and wounded at least nine officers and two civilians. Johnson told officers attempting to negotiate the end of the crisis that he wanted to kill white people, especially white cops. His family told TheBlaze they find that odd, because he did not talk about it with them, and his stepmother is white. Police are convinced Johnson planned and practiced Thursday's deadly military-style assault, and he had received training in a local, commercial combat school in Texas. The Army veteran's so-called "move and shoot" technique puzzled responding officers. While trying to negotiate with Johnson for about two hours, police say he was laughing, singing and asking how many officers he had killed. Dallas Police Chief David Brown confirmed Johnson would only speak with a black negotiator. Unable to reach a resolution, officers armed a robot with about a pound of C-4 explosive to end the standoff. Eleven officers fired at Johnson and two used an explosive device on Thursday night, Dallas Police Chief David Brown said Monday. He noted that the investigation will involve more than 170 hours of body camera footage and "countless hours" of dashcam video. "Bravery is not a strong enough word to describe what they did that day," Brown said of officers' response to Thursday's events. Authorities have said Johnson had plans for a larger assault, possessed enough explosive material to inflict far greater harm and kept a journal of combat tactics. "We're convinced that this suspect had other plans and thought that what he was doing was righteous and believed that he was going to target law enforcement - make us pay for what he sees as law enforcement's efforts to punish people of color," Brown told CNN's "State of the Union" on Sunday. Police say Johnson wrote the letters "R.B." on a wall in blood during the standoff. Investigators are searching Johnson's suburban home, which he shared with his mother, hoping to decipher the initials. Items they've recovered include a journal containing combat tactics and an arsenal two years in the making, including guns and bomb-making materials -- enough, police say, to cause devastating effects to Dallas and the surrounding area. "We're convinced that this suspect had other plans," Brown said. He said Johnson had been practicing explosive detonations. "We believe that the deaths in Minnesota and the deaths in Louisiana just sparked his delusion to fast track his plans and saw the protest in Dallas as an opportunity to begin wreaking havoc on our officers," Brown said. CBS News senior investigation correspondent Pat Milton reports a law enforcement source said that Johnson had hundreds of rounds of magazines attached to his body, giving the indication that he was ready to try to kill more people. The size of Johnson's arsenal, which included rifles and body armor, indicates he had a larger, more complex plan in the works, but the Dallas protest appears to have been a target of opportunity, the source told Milton. Investigators are trying to determine what those possible bigger plans entailed, what the specific targets may have been. Police are also searching Johnson's laptop and cellphones to try and find out whether anyone may have helped him plan Thursday's attack. Investigators have found no links between Johnson and violent extremist groups. The writing suggested that Johnson was wounded in a shootout with police. An autopsy will confirm exactly how many times he was hit. The fact that Johnson had material for explosives and talked of using homemade bombs during a standoff with police before he was killed indicated he could have inflicted more damage with more time, Dallas County Judge Clay Jenkins said. "If this had not been a crime of opportunity where the protest was quickly organized in response to events in the same week ... he could have caused a lot more harm than he did," Jenkins said. The police chief defended the decision to kill Johnson with a bomb delivered by remote-controlled robot, saying negotiations went nowhere and that officers could not approach him without putting themselves in danger. He also said he became increasingly concerned that "at a split second, he would charge us and take out many more before we would kill him." Johnson's time in the Army was marked by a sexual harassment accusation in May 2014 while in Afghanistan. The Army sent him stateside, recommending an "other than honorable discharge" - which is "highly unusual" because counseling is usually ordered before more drastic steps are taken, said Bradford Glendening, the military lawyer who represented him. "In his case, it was apparently so egregious, it was not just the act itself," Glendening told The Associated Press. "I'm sure that this guy was the black sheep of his unit." According to a court filing, the victim said she wanted Johnson to "receive mental help," and sought a protective order to keep him away from her and her family. Johnson was ordered to avoid all contact with her. The shootings just a few blocks from where President John F. Kennedy was slain in 1963 marked the deadliest day for U.S. law enforcement since the Sept. 11, 2001, terrorist attacks. Federal agents are trying to trace the origin of the weapons used, including a military-style semi-automatic rifle. About 30 agents are involved in identifying bullet casings, said William Temple, the Dallas agent in charge for the Bureau of Alcohol, Tobacco, Firearms and Explosives. The attack began Thursday evening during protests over the police killings of Philando Castile, who was fatally shot near St. Paul, Minnesota, and Alton Sterling, who was shot in Baton Rouge, Louisiana, after being pinned to the pavement by two white officers. Video from Dallas showed protesters marching along a downtown street about half a mile from City Hall when shots erupted and the crowd scattered, seeking cover. Among those injured were two officers from El Centro College, the school said in a statement Sunday night, identifying them as Cpl. Bryan Shaw and Officer John Abbott were hurt in Thursday's attack. Shaw was struck by a bullet as he guarded an entrance to the college, but treated on scene, the statement said. Abbott was also guarding the entrance, and was hurt in both legs from flying glass after it was struck by bullets. Abbott tended to his wounds at the scene and then returned to assist others, the statement said. Dallas police previously said seven officers and two civilians were hurt in the attack. Its number of wounded did not include any El Centro College officers.